I am a HUGE fan of Alton Brown – I give him total credit for learning how to cook. I watched the shows and read the books…I think it was because he added the SCIENCE into the explanation of cooking. When you have an understanding of the basics, it’s easy to adapt them into more complex dishes. This has become one of our favorite recipes, and a go-to side dish – it’s highly adaptable – you can add many different ingredients to suit your purposes. Vegetables, dried fruits, nuts…We’ve even made spanish rice by using a different stock and adding ro-tel and taco seasoning. Saute Onions & garlic in oil or butter over medium heat. Add salt and pepper to taste. 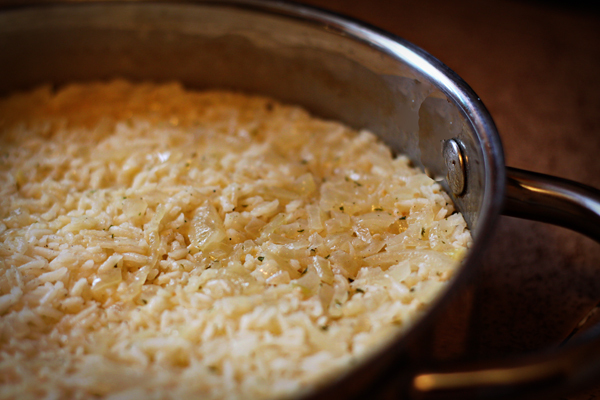 Add your stock, and stir. 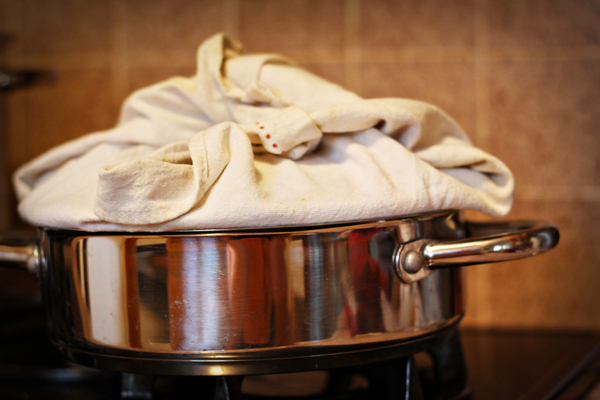 When the mixture comes to a gentle boil, stir once and put a dish towel over the pan and cover with the lid (see photo below). Bake at 350* for 20 minutes, remove from the oven and let sit for 15 minutes with the lid/towel on. Linked to Rachel’s Mouthwatering Monday – She has a fabulous new look (courtesy of yours truly) – go check it out!